Quinn is beloved by an enormous community captivated by his legendary accomplishments, unrivalled devotion, and unending playfulness through his work as a Dog Guide to Randy and a founding Ambassador of the 2020 Vision Quest mission. Though the unfairness of bone cancer took him from us all far too early, his powerful presence lives on in our hearts, in the thousands positively impacted by his life, and all of the shared experiences of Quinn, Randy and 2020 Vision Quest. He was and is still the heart of this organization. 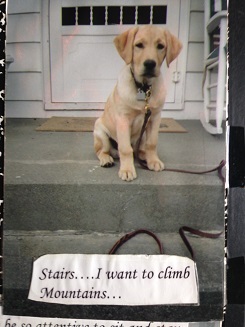 Quinn was born to Guiding Eyes at the Canine Development Center in Patterson, NY. He entered into the Puppies Behind Bars program with much thanks to the sponsors who gave him his name after their own beloved pet. A fun journal of his puppy adventures was recorded and is one of our many treasured possessions. Within its pages was young Quinn atop a flight of cement stairs with a handwritten caption: “Stairs…I want to climb Mountains!” He certainly did that and so very much more! 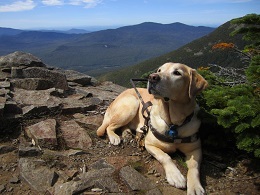 Quinn certainly fulfilled his wish to climb mountains in so many incomparable ways! 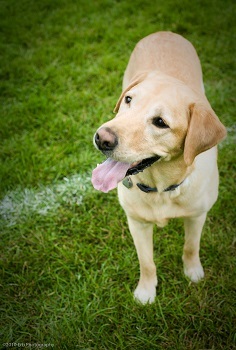 At 16 months old he returned to Guiding Eyes to study under his primary trainer, Chrissie Vetrano. She knew Quinn was a special dog fairly quickly and guided his way through the intensive training program, resulting in his being ready for a match. On October 19, 2006 he was introduced to Randy and the bond began almost immediately. 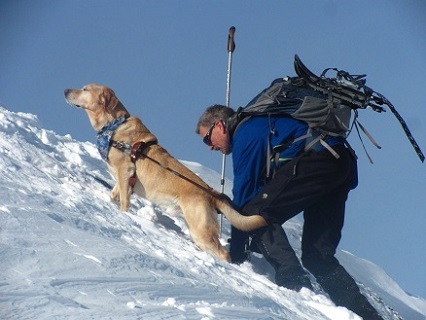 Along with the typical Dog Guide responsibilities of leading around obstacles, stopping to alert blockages from the ground to the 6’4” top of Randy’s head; Quinn was asked to ignore the hiking stick which Randy used to support his balance challenges. Randy was only walking for a few months after nearly two years in a wheelchair and Quinn would halt at a moment’s notice to give additional support. He also would notch up the speed when those long legs were ready to stride. The freedom of those strides and the tension in the harness soon enhanced the healing process in Randy’s brain and Quinn quite literally helped teach Randy to walk again. Featured in hundreds of newspapers, magazines, TV news segments, documentaries, the book Pet Tales: Unconditional Love composed by Eileen Doyon, a Sports Emmy nomination, and an Emmy award-winning “Windows to the Wild” special, Hiking in the Dark with Randy and NHPTV host Willem Lange, Quinn was certainly deserving of his nickname, the Mighty Quinn! His mightiest work of all, however, was not in the adventures or even in the 8 years of daily service to Randy as a Dog Guide in everyday life. Quinn joined Randy in presentations to nearly 30,000 students in which their teamwork, communication, perseverance, problem solving, goal setting, and love were inspirational to thousands of students and adults. Demonstrating by words and deeds the celebration of all of our ability to believe and achieve, Quinn has left his big paw prints on the lives of thousands upon thousands who will doubtless view the world differently for having experienced the focus, love, and devotion of one incredible being. Quinn completed his final hike on August 24, 2013 and it was not long afterwards that the osteosarcoma (bone cancer) was discovered on his skull. By mid-fall an entire community struggled to come to terms with the terminal reality of his condition. Stoic as always, Quinn again led the way for everyone in managing life. He celebrated every moment possible and encouraged his many friends and family to do similarly. His love of so many playful moments had him enticing friend after friend to visit the toy closet and emerge with a “Hedgie”, squeekie ball, or perhaps even his most joyous Tug of War rope. In those moments of play he would lose himself and forego the pain and challenge which began to haunt him more and more every day. On January 20, 2014 Quinn breathed his last while cradled in the arms of his beloved family in Tracy and Randy. He remains with all of us in so many ways including the legacy of inspiration exemplified in his life. In this he too would hope that his work will continue always.